Two layers of the follicular wall are involved in steroidogenisis: the granulosa layer (stratum granulosum) and the thecal layer (theca follicularis). Granulosa cells are the single source of progesterone. Granulosa cells become active in the later, preovulatory follicles and are the single producers of progesterone. 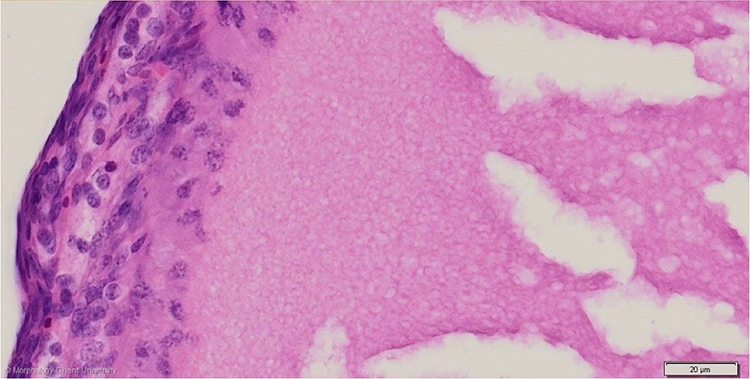 â€˜Islandsâ€™ of pale, endocrine, interstitial cells located in the theca externa are called the thecal glands (cellulae thecales). Thecal glands are already present in small follicles but are more clearly visible in preovulatory follicles. The interstitial cells of the thecal glands and the interstitial cells in the interfollicular stroma have the same morphology. Stromal interstitial cells however only produce androgens whereas thecal glands not only produce androgens but are also the source of oestrogen.